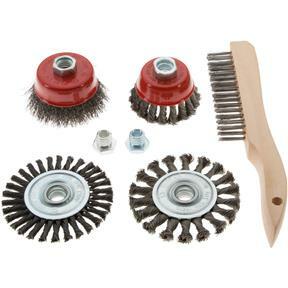 Wire Brush Set, 7 pc. Grizzly T27763 - Wire Brush Set, 7 pc. These handy kits provide an array of steel wire wheels and tools for quick and easy use on your angle grinder. These are always great to keep on hand! 7 piece set includes a scratch brush, a 4" single section brush with standard twist, a 4" single section brush with stringer bead twist, a 3" crimped wire cup brush, a 3" twist knot cup brush, and one each 5/8"-11 x M10-1.25 and 5/8"-11 x M10-1.5 adapter nut. All attachments 5/8"-11 arbor hole. I have done some heavy duty rust removal with thes brushes with excellent results.